After taking an online course on jewelry in ZBrush, I was a little frustrated that the instructor was going back and forth between ZBrush ($795) and another piece of "parametric CAD" software that was more expensive. I had a few early attempts to stretch SketchUp's capabilities to make basic forms for ZBrush that worked okay, but since then I've learned more about ZBrush's ZModeler functionality for hard surface modeling. So you say, "Kat, you're using that crazy terminology again, and I have no idea what you're talking about." Let me explain. ZBrush gives you the ability for more freeform modeling. Imagine sculpting with a ball of clay in real life...you can push and pull the material into organic shapes, creating a model in a very realistic way but in a new medium. The flower shown here is a very basic example of this type of freeform modeling in ZBrush. However, the flower was originally created in ZModeler as a hard-surface model, then sculptural details added with other more freeform brushes. The ZModeler mode in ZBrush is great for creating hard-surface models...this would be like modeling a starfighter...you might start with basic shape and push and pull surfaces to make something more mechanical looking. Here's a fascinating time-lapse video of "Alex O" modeling a war helmet in ZBrush with ZModeler. In jewelry design, I might use the ZModeler functionality to create a square frame for a pendant, then an inner medallion, then switch over to soft sculpting to create the design. When creating a base for 3D printing, I also use the ZModeler functionality. 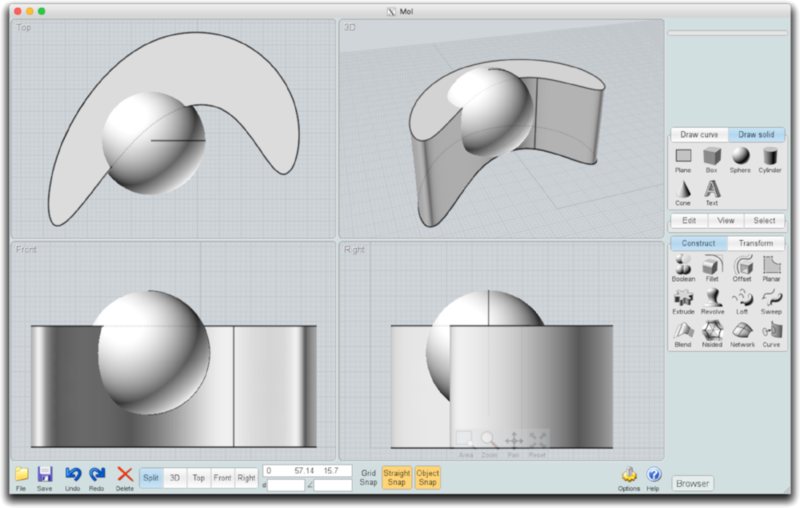 Here's another great video from Alex O that shows him using ZModeler to make a geometric ring. However, something like SketchUp (SketchUp Make, FREE download) is a little more rigid. I can create a box, then push and pull geometric shapes. But if I were making a box that I wanted to be exactly 20 cm, I have a precision built in to the program that can make that happen. That is a characteristic of a "parametric" 3D modeling program. That makes SketchUp...like AutoCAD, Fusion360 (cloud-based, FREE for hobbyists), Solidworks, and similar software...perfect for creating technical drawings and product designs. For example, I used SketchUp to design my jewelry workbench. I had some issues with creating printable models in SketchUp, so I started looking around for another "technical" drawing solution that wouldn't break the bank. Enter Moment of Inspiration, also known as MoI. MoI is $295, works on both Mac and PC, and has a 30-day trial. At first I was a little skeptical. The interface was pretty basic, and definitely wasn't written to take advantage of the Mac interface I'm using. But then again, neither is ZBrush. After a couple of YouTube videos I was up and running, and I was able to figure out the rest on my own. So what is MoI good for? Probably almost any kind of technical modeling you might want to do except freeform "clay" type modeling. You could take a freeform "extruded" shape and "subtract" a sphere from it. Combining different "primitive" shapes, such as cubes, cylinders, and spheres, you can make pretty complex models that export well. Turning on a "grid snap" or "object snap" helps line things up. Then you can export these items easily, bringing them into the PreForm or other "slicing" software that prepares the file for 3D printing. I jokingly say that the second phase of having access to a 3D printer is when you start making your own tools. I purchased some frames for making rubber molds from Rio Grande, but they were too wide to fit in a nifty little spring clamp that holds the split mold together while filling with hot wax. Additionally, trying to estimate the amount of two-part "RTV" (room temperature vulcanizing) mold material usually resulted in wasted material...and at $56 a container, it's too expensive to do that! So my "improved" version has markings on the side to indicate centimeters, and a handy spreadsheet calculates the exact volume and weight of RTV needed. Remember the ability to measure in a parametric modeling program? Because MoI works that way, my one centimeter marks are accurate when printed. In ZBrush, that would be more difficult. And because I'm a dork, I added www.katkramer.com and my logo to the side...and it was backwards, so when the rubber mold is made, my website address doesn't read correctly. Oh well, there's always version 2. So in a nutshell, MoI is a nice little program, and the models created are accurate in size. It is a nice alternative to more expensive programs for making basic models to bring into ZBrush.